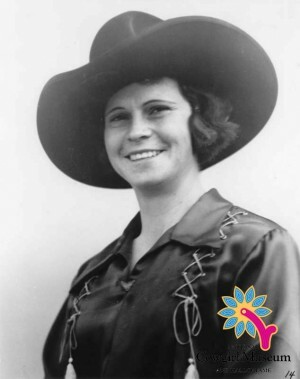 In 1941 Vivian was the winner of the last cowgirl bronc riding event at Madison Square Garden. Her rodeo career began when she was fifteen, riding steers and buffalo in exhibitions. A champion trick rider and bronc rider who held the distinction of never being bucked off in the arena, Vivian’s rodeo career lasted eighteen years. She retired with the birth of her daughter and turned to raising cattle and quarter horses.